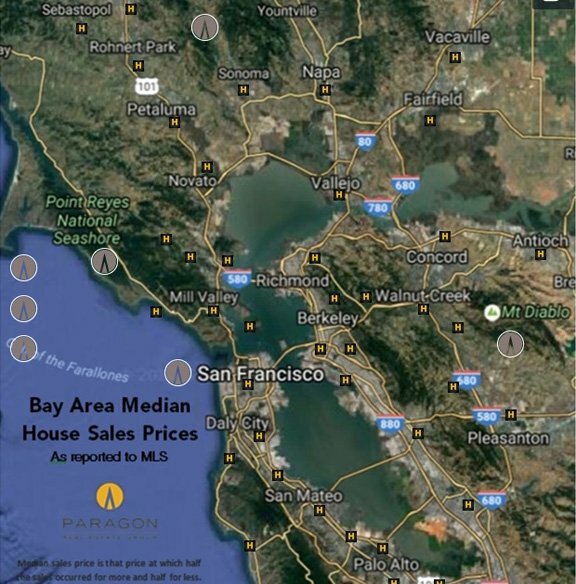 The much visited and watched Bay Area Home Value Maps have been updated at paragon-re.com (see link below). The interactive maps (mouse over the town or neighborhood and up pops current median home prices) are a fun and informative way to quickly move around the Bay Area as an overview entirety or to look at home prices in San Francisco and Marin, Napa, Sonoma and Contra Costa counties up close and personal. The Bay Area Home Price map is the one updated so its information is current as of October 31st 2016 while the SF and county maps were last update a few months ago. The maps include home and condo sale prices. View the map and accompanying explanations by clicking here.